12/03/2019 - During spring tomato growers see whitefly infestation pressure increase slowly, but surely. At this time of year, predatory mirid bugs - such as Macrolophus pygmaeus - are often not yet at full strength. However, Biobest’s biological insecticide PreFeRal® is a valuable addition to the control strategy. “Containing spores of the Isaria fumosorosea fungus, PreFeRal® works best at high relative humidity,” explains Biobest Advisor, Stefan Bohté. “That is why it is important to choose the right moment to apply the product – for example, at the end of the day.” At sufficiently high humidity, the spores germinate well and the fungus infects various lifecycle stages of the whitefly, killing it. PreFeRal®controls various whitefly types including greenhouse whitefly (Trialeurodes vaporariorum) and tobacco whitefly (Bemisia tabaci). “In recent years, we have seen pest levels in tomato crops increase,” warns Stefan. 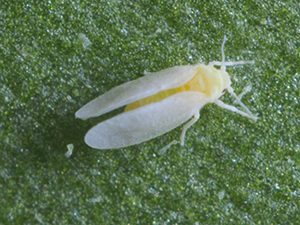 “Once the greenhouse whitefly is under control, Bemisia populations can increase again. This whitefly can transmit many harmful viruses.